Certain thematic threads run through all immigrant stories: assimilation vs. tradition; whether or not to retain the old language, culture and customs; and the inevitable cross-generational and cross-cultural clashes. All appear in Danai Gurira’s 2016 “Familiar,” a comic drama (or is it a dramatic comedy?) — and a whole lot more. A little too much, in fact. It’s her older sister, Tendi (Tendikayi), the “perfect” one, the more conventional, upright, tightly-wrapped attorney, who’s getting married — to a white American man. They’re both hyper-“Christianized” (and practicing abstinence — to the amused astonishment of the bride’s sister and groom’s brother). And they both want to honor her Zimbabwean heritage by having a pre-nuptial Shona ceremony, “roora,” which includes the groom’s family paying a ‘bride-price’ (which, in the homeland, often entails goats and cows). The Zim/American culture clash is the funny centerpiece of the first act. The ululations and spontaneous, joyful Shona singing are a highlight. 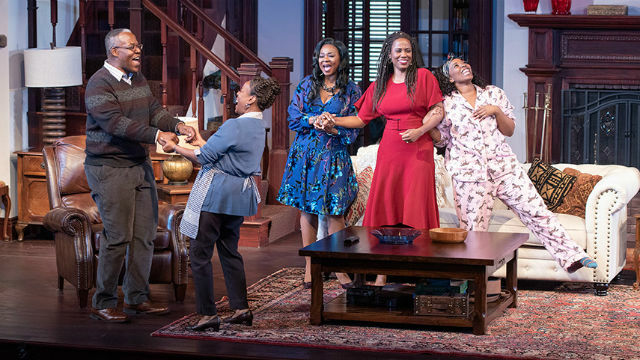 Surely, there’s no quibble with the production, with its marvelous set (a detailed well-to-do, bi-level, high-ceilinged home, with touches of Africana, designed by Walt Spangler). The sound (Rob Milburn, Michael Bodeen) is crisp, and the lighting (Jason Lyons) enhances the action and interactions. As the indomitable — and not always likable — Zimbabwean aunt, the riveting Wandachristine is a veteran of the show, having toured in the role before. Danny Johnson gives a sensitive portrayal of the conflicted father of the bride. Together with Lucas Hall as the groom and Anthony Comis as his less polished, more amusing brother, the men provide a nice counterpoint to the well-educated, well-spoken, constantly quarreling females: excellent Cherene Snow as Marvelous, the strict mother who is hellbent on assimilation and has high expectations for her daughters; energetic and convincing Olivia Washington and Zakiya Young as those daughters (though the older one, Tendi, has been given a number of under-motivated actions); and Marvelous’ two sisters: Anne from Zimbabwe, whom she resents; and Margaret/Maggie (down-to-earth Ramona Keller), who tries to be the family peacemaker. Pat Launer, a member of the American Theatre Critics Association, is a long-time San Diego arts writer and an Emmy Award-winning theater critic. An archive of her previews and reviews can be found at patlauner.com.